Actually, the second edition of PL/SQL programming is what jump started my career as a PL/SQL developer. 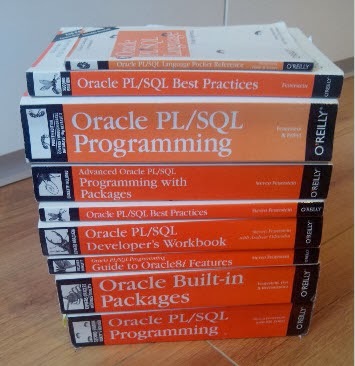 I was sold to my first Oracle customer as an Oracle developer, while I had actually never written any PL/SQL. So I raced to the biggest bookstore in Rotterdam and guess what I found [Steven: the biggest computer book he ever saw? :-) ]. The sad thing is these kind of books cannot be found in physical book stores anymore. For years I used to visit Barnes & Nobles in WPB and pick up an Oracle book when on holiday. Every year the computer book section would occupy less space, and would recently only offer books on iPhone programming, Excel for dummies and such. This year I didn't even bother. Even my favorite bookstore of all times, Computer Book Centre in Funan Centre Singapore is now on line only. Wow, his favorite bookstore is in Singapore. I like that! I have to say that I've never been overly concerned about how my books might help a corporation improve its bottom line. But I have always felt very satisfied when I hear how my books may have helped an individual's career. Hi Steve, On this context, I loved your developer workbook. Do you have any plan for new edition. Thanks, Tanmoy. I have no plans for a new edition, largely because I have instead created a whole website full of way more and better quizzes: plsqlchallenge.com. Actually, the first of your books that I encountered and still enjoy A LOT to read was "Oracle Built-In Packages". I like very much that approach and style of supplying very detailed explanations and examples for a feature. but still doing this at the same level of detail would be most welcome. if we compare it with the older versions.